“Like” us on Facebook and follow us on Twitter/Social Media. File petition with the South Korean government through e-People. Call the South Korean embassies in your country. 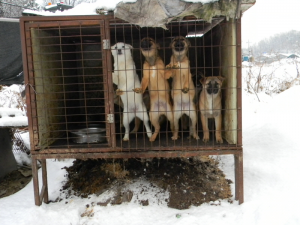 Tell the South Korean Ambassador in your country to stop the torture and consumption of dogs and cats in South Korea and that you will boycott South Korean products and tourism until they end this barbaric practice. Click HERE for the South Korean embassy contact information and sample letter/talking points. Click HERE to sign all petitions and share. Change.org lets you easily share with all your Facebook friends. Boycott South Korean products and tourism. Tell the retailers why you are boycotting their products. Click HERE for list of South Korean Global 500 Companies. Contact South Korean government officials. Attorneys – Provide legal consultation and service. Translators – Translate Korean into English, translate our English website main page into your native language. Click HERE to contact us if you would like to help! Donate to animal rights organizations in South Korea. We do not take donations. However, for the animal rights organizations in South Korea, your financial contribution and generosity is critical for continuing the important work of ending the dog meat trade. We appreciate your generosity in supporting these organizations! Click HERE to donate. Celebrating your Birthday by asking your friends to donate to these organizations instead of bringing gifts, is a wonderful way to show that you care and they will most likely admire you for it. Click HERE and scroll to the bottom to subscribe to our newsletter for news updates and calls for action. Write to your government to get involved. Ask news media to report this issue! Put an animal-friendly message in your e-mail signature and include a link to KoreanDogs.org. Click HERE for our collection of animal friendly quotes. Post comments about Korean dog meat trade on articles online and include links to related KoreanDogs.org webpages. If your local newspaper writes an article on the South Korean Dog and Cat Campaign, keep the issue current by writing a letter to the editor of your local newspaper. Please see sample letter below, or if you’d like to write your own, see “Talking Points.” Be sure to keep the letter under 200 words and include your name, address, and telephone number so the newspaper can contact you for verification. Thank you for your article on the South Korean Dog and Cat Campaign (include title of article and date that it ran). It is terribly disheartening that the South Korean Government has laws in place to protect dogs and cats from abuse but it blatantly ignores its own laws. Two and a half million South Korean dogs are electrocuted, strangled, boiled often while they are still alive or beaten to death each year. They are killed in the cruelest ways imaginable, because of the insidious myth that the more an animal suffers, the more tender and tastier the meat and that so-called medicinal properties will be enhanced. Thousands of cats are also slaughtered for soups and “health” tonics. While the practice of eating dogs and cats is not widely accepted in South Korea, it is up to the South Korean government to ensure that this practice is completely eradicated. Caring citizens around the world, including South Koreans, should not sit back while dogs are beaten to death for a tastier meal and cats suffer agonizing deaths. We will continue to update this list. If you have any suggestions, please contact us.